Last week’s opening episode of “Star Wars Rebels” featured two familiar faces from not only the prequel trilogy, but the original trilogy, as well. 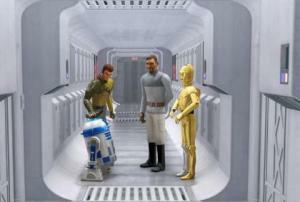 In “Droids in Distress”, we see C-3PO and R2-D2 seemingly serving their mistress who works for the Empire, then taken by the crew of the Ghost (well, really, R2-D2 is convinced by Chopper and C-3PO follows). 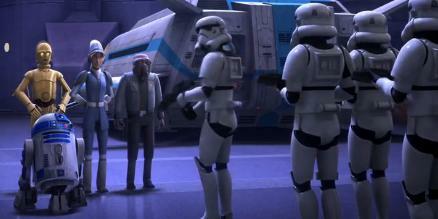 While C-3PO sends out distress signals to the Empire, indicating their loyalty to their mistress, ultimately, they were sent on a mission, we discover at the end, by (Senator) Bail Organa, to whom their real loyalty lies. As any viewer of the original trilogy wonders, what were C-3PO and R2-D2 doing before we find them jettisoned from Tantive-4 onto Tattooine, while belonging to Princess Leia? And, as viewers of also the prequel trilogy, we wonder what happened to these two droids after Anakin Skywalker turns into Darth Vader (since R2-D2 was with Anakin) and Padmé dies (since C-3PO was with Padmé)? While the answers to these questions, from viewing this episode, might indicate that they were in the care of Bail Organa this whole time (ultimately, transferring to Princess Leia). And, since this is the first time in the new canon that these two droids have appeared onscreen in between episodes III and IV, that may well be the story. 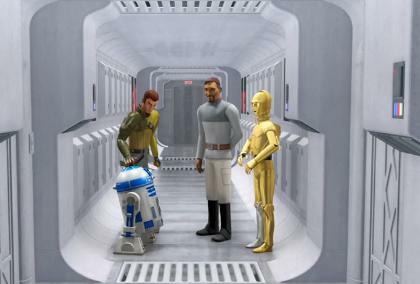 However, this is not the first time that they have appeared onscreen in between episodes III and IV – in fact, one of the first Star Wars television shows was entirely about R2-D2 and C-3PO. “Star Wars: Droids” aired roughly a dozen episodes in the fall of 1985, with a subsequent 44 minute television movie in the spring of 1986. Throughout it all, these two droids bounce between several different masters, none of whom are familiar to viewers of the original or prequel trilogies. We shall see if/when R2-D2 and C-3PO return to “Star Wars Rebels”.